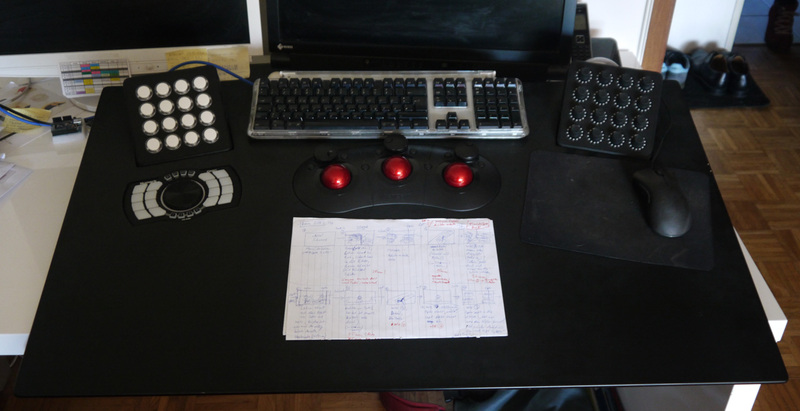 In a nutshell: Its 3 trackballs, 3 dials, 2 reset buttons per dial/ball, 2 extra buttons A and B, it costs arround 370EUR and connects via USB. The housing is made of (cheap) plastic and so it makes some noise when moving the balls, but the trackballs and dials are quite nice. I think its "ok" for the price. I'm using it with Davinci Resolve and the setup is quite easy (less than 5min): download the Tangent hub software, install it, connect the Ripple, start Resolve, select Tangent Elements Panel (the Ripple simulates the Element TK), have fun. The balls/dials controll the left 3 colour wheels/bars of the Colour page (I have not figured out how to controll the right most wheel/bar). The left reset buttons reset the respective colour wheel, the right buttons reset the respective colour wheels and luminance. Extra button B toggles "bypass all grades" on/off and I have no idea what the A button does. The panel sits very stable on its four rubber feet..
Its nice to be able to controll 2 or 3 colour wheels at once - much better than one by one. The trackballs are nice, heavy and feel good, but I have to adjust the sensetivity (if thats possible) as small changes are a bit imprecise. I wish the B button would only bypass the current node, not all nodes. I have not found any way to reassign the A and B buttons to other functions (but maybe its possible). Take the trackballs out of the housing if you want to pick up the panel and carry it arround! They are not enclosed by the housing and easily fall out (they are heavy!). If the panel wobbles on a flat surface, relocate the USB cable - it doesn't like to stay in its groove. As you can see in the pictures, I'm going to use the Ripple (3 trackballs) with a Midifighter Twister (16 programmable rotary encoders) and an Icon Istage (lots of buttons) for my colour grading setup. The Ripple does work out of the box. The Twister works really nice with Controllermate and I'm nearly finished with the program to control a lot of functions in Resolve with it. The Istage might be replaced soon, as the hardware is quite nice for the low price, but the software/firmware is total crap... really, its the worst I have ever seen. I will try a Korg Nanopad2 soon, hopefully this will work better. So, it is light? May be stick some metal bar to the bottom? Besides the balls it is super light (there is really not much in the housing) but nevertheless it sits very sturdy on the desk - so far no need to make it more heavy (don't know what happens when the rubber feet get dirty over time). Update: Seems like the problem with the right trackball is unique to my panel - I should get a replacement early next week. Update: Got a replacement Ripple yesterday directly from Tangent Devices UK, now all 3 balls move equally smooth. The defective panel will be picked up soon. Really good service from picturetools.de (where I bought the Ripple) and Tangent Devices! Great! I'm curious to know how different are the Twister and the BCR2000 by Behringer when used as rotary controller on Resolve. I don't know much about the BCR2000, but it should be similar - the only big difference, and thats why a choose the Twister, is size. One thing I do not understand is why so few people invest in such physical interface devices. Thats something I don't understand too. It is so much more relaxing, efficient and faster than using mouse and keyboard for everything (especially on Mac, as the Apple mouse driver is the worst BS of software I have ever seen). On the other side, such hardware was quite expensive till recently and adapting midi controllers takes some time and a little bit of programming. thanks for sharing! In which modes (color wheels, curves, LUT, vector) is it suitable for ColorFinale? @peaceonearth Sorry, but I don't use FCPX. But it "emulates" the Tangent Element panel - maybe you can get some info on that combo. In general the balls are used for lift/gama/gain or shadows/mids/highlights colour wheels. Curves are a very specific tool, best used with a mouse or tablet. I don't know what you mean by "LUT" and "vector".